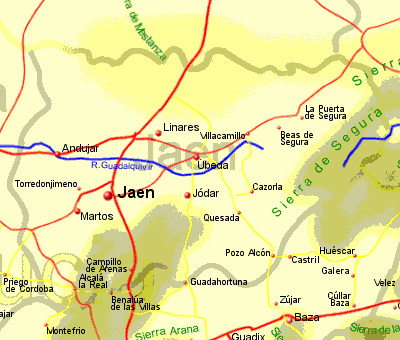 Jaen is one of the lesser known Andalucian provinces to those outside of Spain, greener than much of the rest of Andalucia, containing the source to the Rio Guadalquivir, which flows through Sevilla on its way to the sea, and where 60% of Spain's olive oil is produced (the olive oil producers trade fair held in Jaen city during October is said to be the largest in the world). In the eastern corner of the province lies the Sierra de Cazorla Natural Park, possibly the most attractive park in Andalucia, covering almost 20% of the province. The park has large pine forest with rocky outccrops rising to over 2000m above sea level and contains the source to the Rio Guadalquivir and the Rio Segura, which flows through Murcia on its way to the sea. A number of the small towns contain notable Renaissance buildings and there are many small whitewashed villages and farm houses. The city of Ja�n, with its impressive Renaissance Cathedral and stunning views of the city and surrounding olive groves from the restored castle, which is now a Parador (state run hotel), pleases many a visitor. The attractive towns of Baeza and Ubeda are also well worth a visit.